Crete (population 7,346) is located in northeastern Illinois in the northeast portion of Will County. Illinois Route 1, also known locally as Dixie Highway, is the main roadway to and from Crete. The Union Pacific Railroad line passes through Crete as well. Crete is located about 20 miles southeast of Joliet. The area where the town is located was first settled in the 1830s. In the 1840s a man named Willard Wood and his wife Diantha began a village known as Woods Corners. Mr. Wood eventually named the town Crete after writings from St. Paul in the New Testament of the Bible. The village was platted in 1849, it was incorporated in 1880. It has grown from 760 residents in 1900 to nearly 7,500 in the year 2000. Its location near Chicago gives Crete a bright future for continued growth. 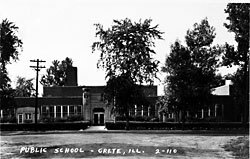 "Crete High School began in 1932 as a two-year program using the 1928 Crete Public School building. The previous wood structure burned in 1928. Prior to this date high school students had to attend Peotone or Chicago heights Bloom. An addition was added in 1937 with a grant from WPA. The high school became a 4 year program in 1940. Crete merged with Monee in 1948 to form Crete Monee Unit District 201-U, as a result of the state consolidation program at that time. The Crete building was used for the high school until a new Crete-Monee High School building was built on another site in 1954. The Crete School is now utilized as the Crete Elementary School and has been added on to many times. The original facade was eliminated in 1980. There has been serious talk of late of abandonning this building in favor of a more modern structure to be built on another site." Crete HS Team nikckname: "Warriors"
Crete HS Fight Song: "Here's To Crete High"
Though the Crete High School kids did not win any IHSA hardware, we know the boys competed in basketball. The web address of http://sites.google.com/site/xtmi2000/il1935dist-1 shows that Crete High School was defeated by Blue Island High School in the 1935 IHSA District Tournament held in Chicago Heights. We also know that Crete High School boys competed in football and baseball through the 1940s. Unfortunately this is the extent of the information we currently have regarding the Crete HS athletic program. If you have any further information to add, please contact us via the means listed below. John Boehner tells that, in the 1940s, Crete HS students could participate in NHS, choir, band, FHA, Operator's Club (A-V), mechanical drawing club, student government, and library club. "Verne Crackle was hired as superintendent of the Crete Schools in 1928. He later became Will County Superintendent. Crete had football and basketball in the 1940s.The gym, with the stage and original bleachers removed, still is used by Crete Elementary students. In the late 80's or so, the west gym wall separated from the rest of the building, collapsed, and had to be replaced. Crete High School had a curious "portable building" that was used from everything from industrial arts classes to a cafeteria. It was considered portable because it could be dismantled and moved and rebuilt. After the new Crete Monee built in 1954 added industrial arts rooms, the portable building was moved to the new high school site and was used for maintenance. It has been demolished."